For almost 100 years, the Lee Strand Co-op has been processing and distributing milk in the Kerry region and more recently to the West Limerick and North Cork area. Established in 1920, the Co-op is owned by the farmers as shareholders. The Co-op takes milk from farmers from within a 20 mile radius of their depot which is located on a 10 acre site at Ballymullen in Tralee. Lee Strand has an average yearly intake of 26.5 million litres. There has been many changes over the years, but one thing that hasn’t changed is the high standards that Lee Strand has always prided itself on. “We have high standards in farming excellence and are yearly recipients in the National Dairy Milk Quality Awards. Our success is attributed to the fact that we source all our milk from seventy-one local farmers all within 20 miles of the processing site. Therefore, providing Lee Strand with the freshest milk while also producing a product with a low carbon footprint,” said Jerry Dwyer Milk Operations Manager. “We have a strong commitment to quality as well as protecting the environment and have received many prestigious awards. Sustainability and environmental management are central to day-to-day business management at Lee Strand Co-op. The company is accredited to ISO14001 since 1998 and EMAS (Eco-management and Audit Scheme) since 2000. As a leading food company, Lee Strand Co-op’s focus is on resource efficiency and our achievements in terms of the efficient use of energy and water have been clearly demonstrated. Lee Strand Co-op is fully committed to the Origin Green programme and to meeting our sustainability targets,” he added. 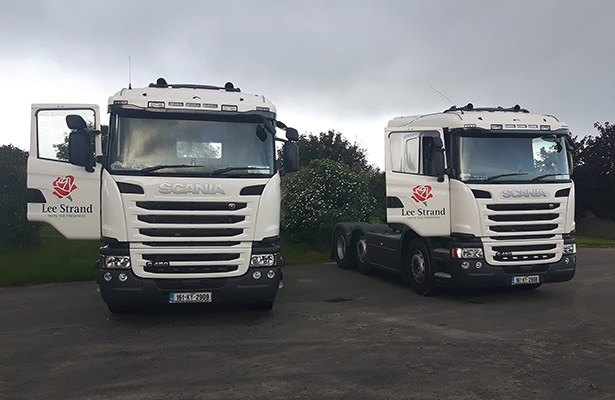 Lee Strand have a distribution fleet comprising of 14 milk distribution routes direct to stores, two milk distribution routes to multiples, two bulk collection tractor units and four trailers. “We recently invested in two new tractor units for bulk collection from Nolan’s in Castleisland. They are both Scania G450 (LA6x2/4) and have been in operation since June. The reason we went for Scania is that they include fleet management report on a weekly and monthly basis, this helps to keep an eye on vehicle/driver performance as well as vehicle efficiencies,” said Transport Administrator Ciara Herlihy. With 25 full time drivers on the books, there is a lot of focus placed on driver excellence. 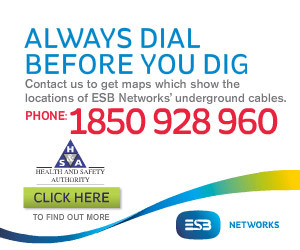 “The main responsibilities in this area include Driver CPC training compliance; forklift/ food safety training/manual handling training for drivers; tachograph analysis and compliance; CVRT testing; servicing and maintenance scheduling; tachograph calibration; tax/insurance compliance; tyre inspections scheduling; daily walk around checks and vehicle cost efficiency report generation, ” added Ciara. “We sub out the maintenance work on our vehicles to Denis Collins Garage Ltd and Kerry Truck Services. It is important to keep the fleet in good working order as there is no room for downtime given the time restraints we have,” stated Jerry. “As a company we are confident in the quality and professionalism of our drivers, as they are all aware of the responsibility involved in being in the distribution industry and travelling the roads every day. All new drivers undergo a driving assessment with a qualified instructor before commencing employment and operating Lee Strand vehicles,” he stressed. Lee Strand is a progressive company and they are always looking at ways to expand and in recent years they have diversified into the property market and owns and operates a multi-story car park in Maine Street, Tralee and the Tralee Town Centre Apartments. Lee Strand also has developed Centre Point in Tralee, which includes commercial and retail units, penthouse suites and a 250 space car park. Brownes Agri, Steel and Builder providers in Castleisland, County Kerry is also part of the Lee Strand portfolio. Lee Strand also developed the Lee Strand Stacks Mountain Wind Farm a 16 turbine wind farm located between North Kerry's Stacks Mountains and Castleisland. The Co-op has an excellent relationship with the community and have supported many projects over the years including sporting and charitable organisations as well as other events all benefit from their generosity. “Every year over 10,000 hardback homework journals are distributed to pupils in Kerry, West Limerick and North Cork. Lee Stand also offers complimentary tours of our plant in Tralee to primary and secondary schools and third level colleges, to date over 10,000 students have visited the plant,” revealed Ciara. Lee Strand has a proven track record in managing energy and sustainability. Lee Strand's commitment to and resource efficiency has been acknowledged by the achievement of Energy Master of the Year Award 2008, a prestigious award made by Sustainable Energy Ireland. Lee Strand has also received many other accreditations including: FSSC22000 - Quality; ISO 14001:2004 - Environmental Management; Excellence Through People and the Health Mark. “Taste the Freshness” is used in Lee Strand’s branding and this is achieved by their target of getting their product from “Farm to Shelf in 24 hours” which offers brand competitive advantage and distinctive taste to the consumer. Generations of Lee Strand milk drinkers stay loyal to brand because of the fresh taste.